Disney parks are often referred to as the most magical place on Earth. With so many people all in one place, though, it’s not surprising that some pretty strange things happen there on a daily basis. 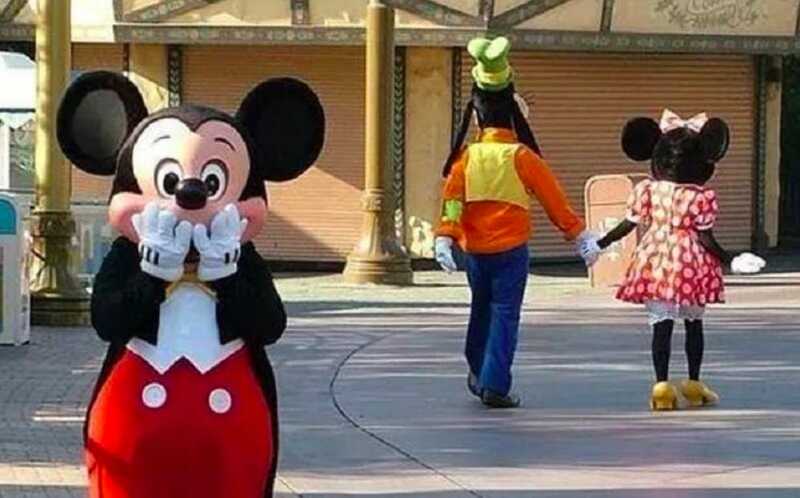 Whether it’s the people visiting the parks, or the people hired to work there, their curious antics have all been caught on camera and posted online for us to enjoy. 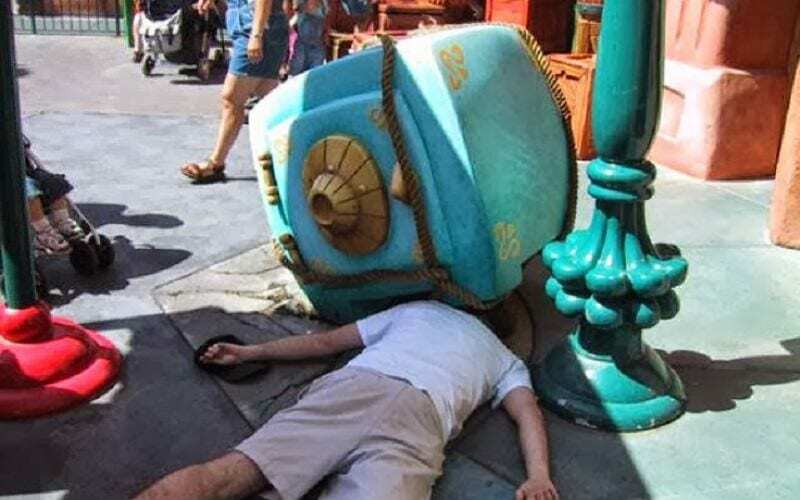 If you’ve never been to a Disney park before, this is the kind of stuff you could be missing. It’s easy to forget that the people who dress up as your favorite Disney characters have a life of their own. 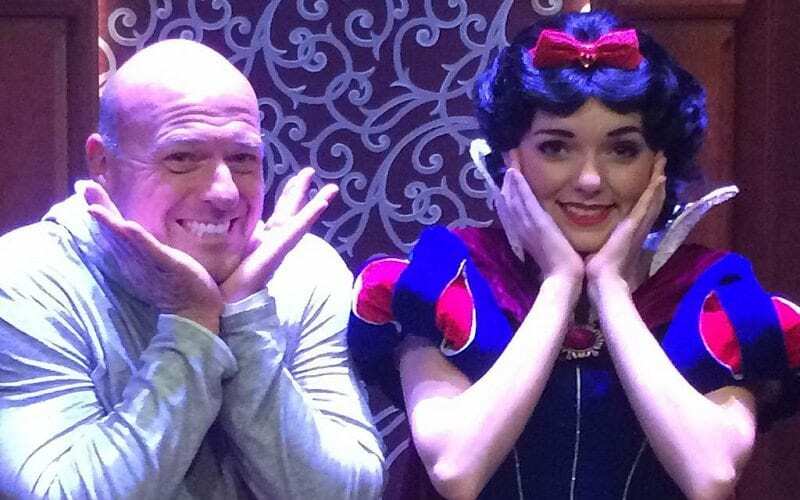 Snow White might seem all smiles and innocence when you see her at Disney World, but underneath the costume is a woman you know nothing about. 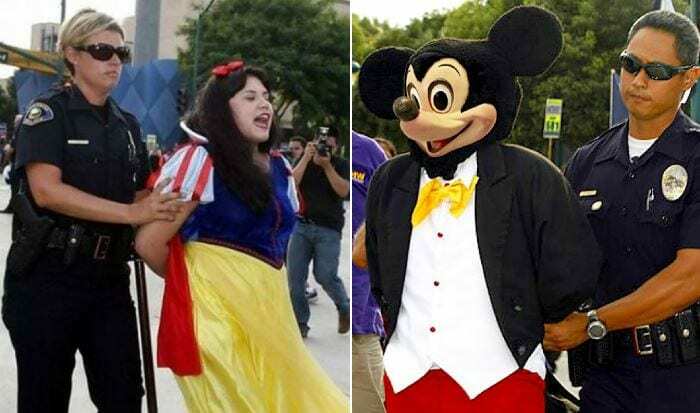 We can imagine that kids were pretty traumatized when they saw their icons being carted off by the police, and wanted to know what it was that Mickey Mouse had done. Mom and dad probably had a great time answering all their questions. Given the permanent smile fixed on Donald Duck’s face, it’s hard to say exactly what’s going on here. On the one hand, it looks like the Disney character is chasing after his brethren as they wander through the park. However, he could very easily be shooing them away, trying to keep them out of harm’s way with all the people around. Or, there’s always the possibility that he is just simply trying to make new friends with creatures of his own kind. The point of going to an amusement park is to have fun, but some people haven’t gotten the memo. 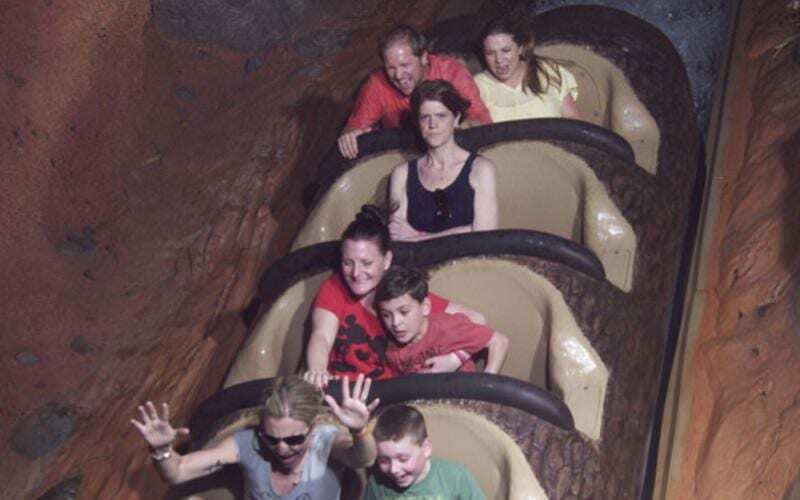 After this woman’s husband ditched her at the Splash Mountain ride, she made her feelings very clear. Props to her for keeping a straight face as she plummeted towards the Earth. It’s hard not to get caught up in the excitement of the ride, especially when everyone around you is screaming their lungs out and having a good time. We’re sure the husband got an earful when the ride was over. Talk about a big kid! 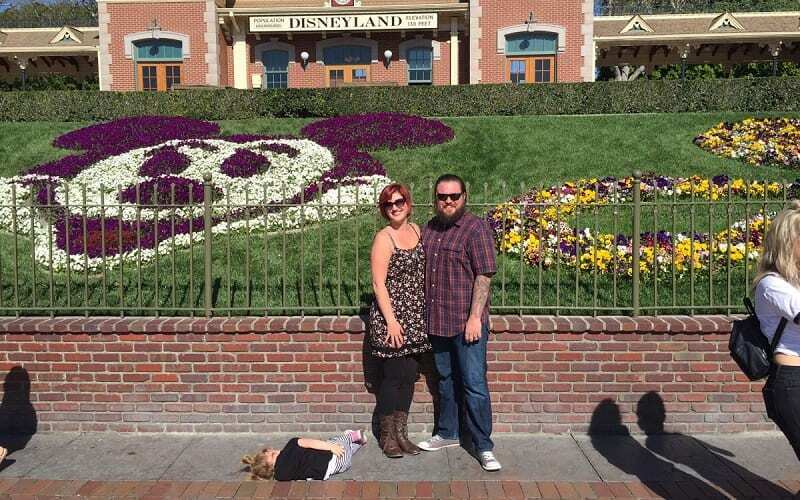 If you thought that only children could really enjoy themselves at a Disney park, then you were wrong. 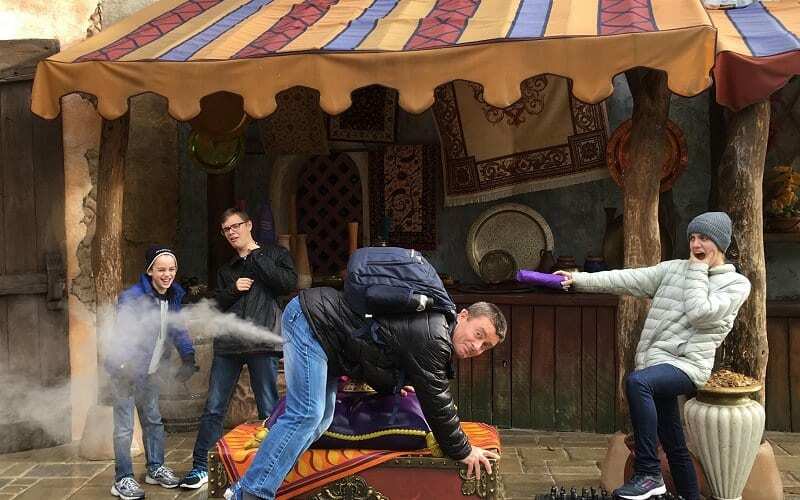 This dad seems to be having more fun than the rest of his family, and he’s not afraid to act a little childish when the moment suits it. Sure, his kids might be mortified by their father’s behavior, but from the looks of things, he’s not too bothered about that. If he’s spending his vacation at Disneyland, then he’s going to do things his way. Mickey Mouse might have given his heart to Minnie, but that doesn’t mean he can’t still play the field. 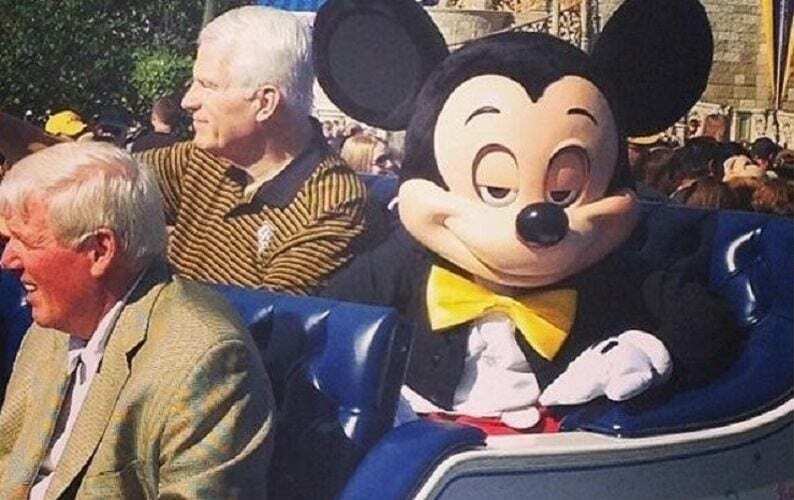 Given the Disney parks are always filled with people, Mickey probably doesn’t have any trouble finding someone to spend his time with. However, whether they’re receptive to his advances is another matter entirely. What would you do if the iconic Disney character turned to you and flashed this sultry look? We get that he might be hard to resist, but we don’t think we could ever see Mickey in that way. Most people go to Disney parks because it’s where their children want to go. Kids have been known to put up a fuss when their parents refused to take them, although it looks like this kid did the opposite. 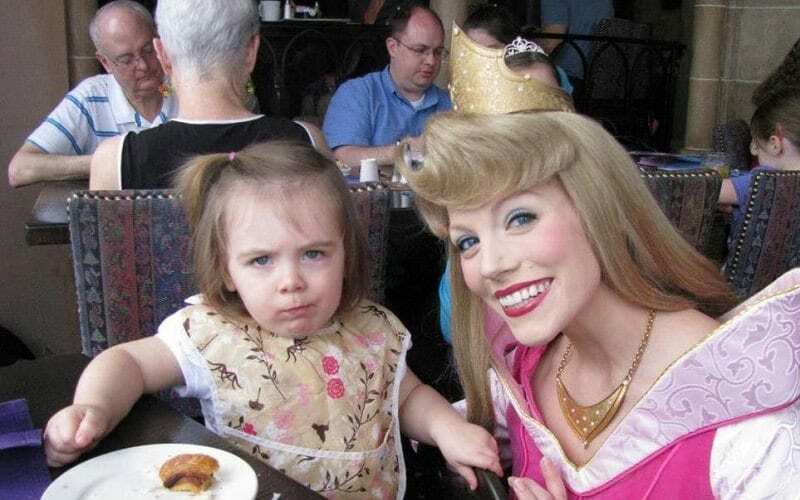 You’d think that being approached by Aurora would put a smile on any child’s face, but apparently, Sleeping Beauty isn’t this girl’s favorite fairytale. Maybe she was hoping for Cinderella or Snow White instead. We certainly wouldn’t turn away a meeting with Aurora if it were offered to us. Gaston spends the whole of Beauty and the Beast believing that he can have any woman he wants, and it ends up being his downfall. If you thought the Disney villain would have learned from his past mistakes, though, you’ve got another thing coming. He’s still trying to charm anyone that catches his eye, but he’s still not having much luck. 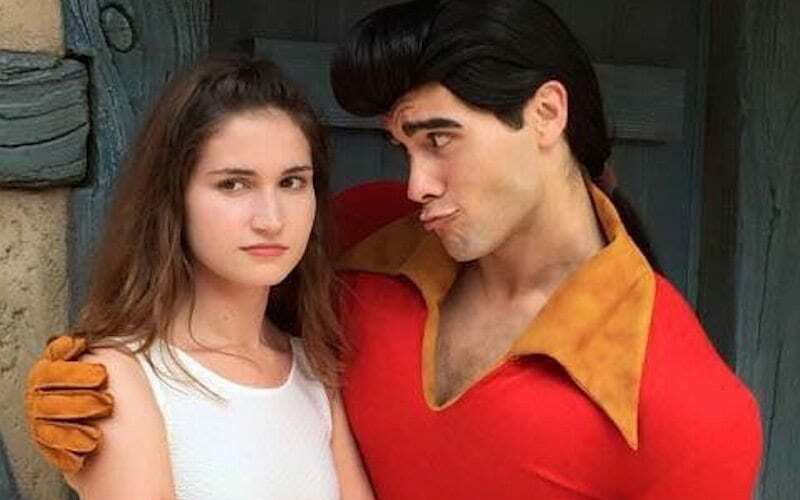 It seems that Belle isn’t the only woman who’s resistant to Gaston’s advances, although hopefully, this one doesn’t have a beast waiting in the wings too. If you’re a parent that’s going to a Disney park with your kids, you have to get into the spirit of things. Unless you want to spend the next week miserably following your children around as they bounce from one thing to another, it’ll benefit you to get involved. You might not like Disney, but this is just one of those many sacrifices you have to make for your kids. Besides, if you embarrass them enough while you’re there, they might not ever want to go again – problem solved. And yes, that also applies to celebrity parents, like Dean Norris. Disney parks aren’t just for the everyday family. Plenty of celebrities love to get their Disney fix every now and again, including actress Drew Barrymore. 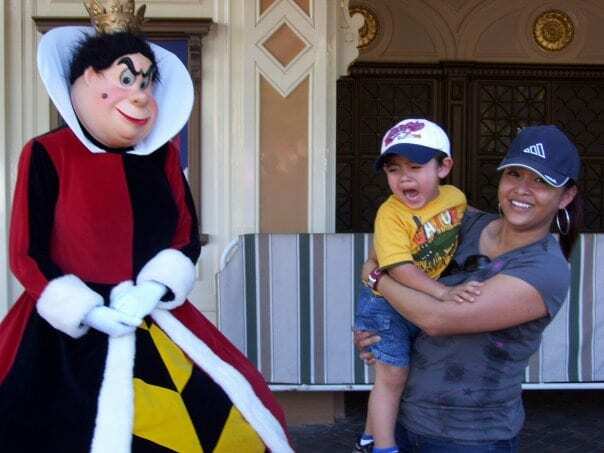 The star has made a habit out of taking her children to the theme park, although she doesn’t always have the best time. Just like any other parent, Barrymore has occasionally had to deal with her young ones throwing tantrums when they don’t get their way. Rather than letting it ruin her vacation, though, she just pretends she has no idea what’s going on. The last thing that you want to do when you’re at one of Disney’s parks is to upset the people that work there. While they’re in costume, the actors embody everything there is about their character, so bringing up their enemies isn’t going to go down well. 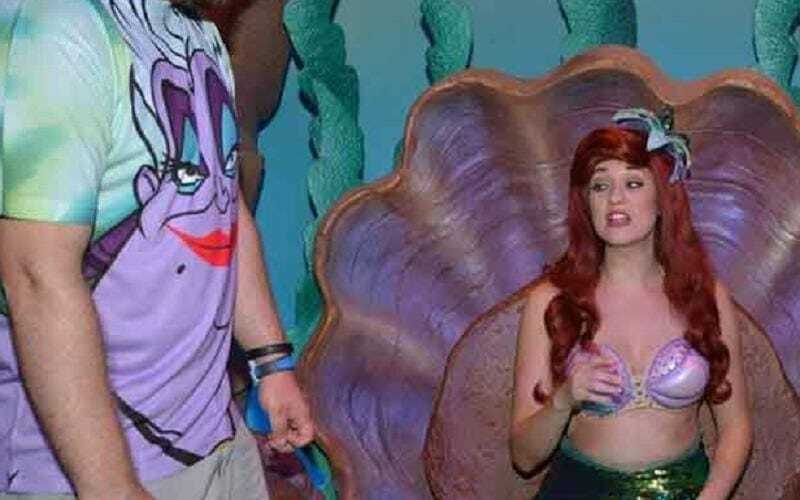 Wearing Ursula on your shirt when you’re visiting Ariel probably won’t get you a great response, although she’ll definitely have something to say to you. It might not be very nice, but what else do you expect? Speaking of inappropriate t-shirts, this one is right up there with the worst of them. Given that Mickey and Minnie are two of Disney’s most iconic characters, wearing a shirt that reads “dead mouse” isn’t ideal. We get that deadmau5 is a successful musician who means no harm towards the rodents, but a Disney park probably isn’t the best place to go parading around in his t-shirt. You don’t want to declare war on the company’s most popular characters because that won’t end well for you. 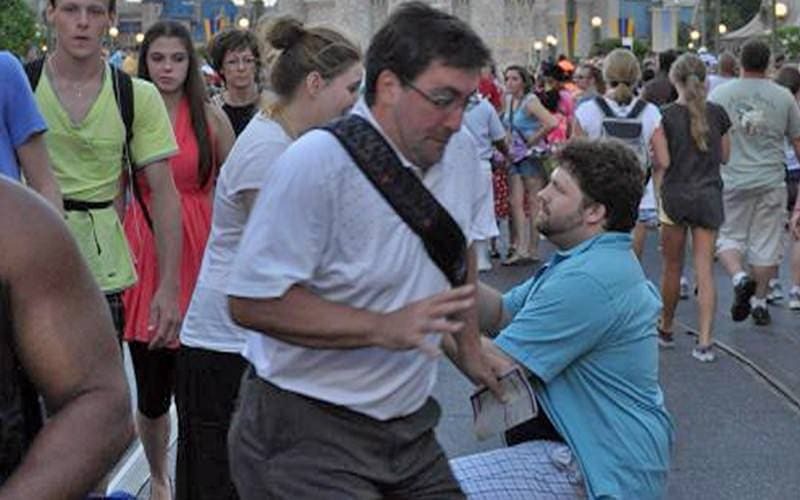 People get very swept up in the moment when they’re at a Disney park, and proposals happen pretty much every day. While it’s usually between visitors, it’s not unknown for a guest to try their luck with one of the characters. 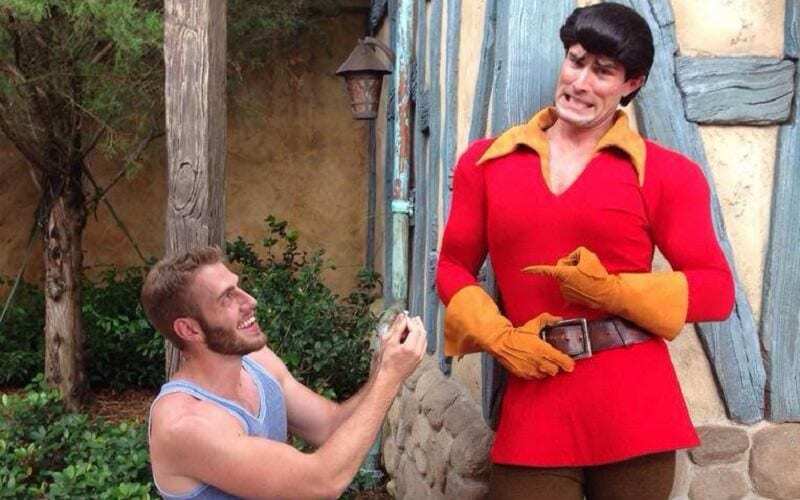 This guy got down on one knee and popped the question to Gaston, though it doesn’t look like the answer was yes. Luckily, the proposer didn’t seem too broken-hearted, because he proceeded to ask for several of the princesses’ hand in marriage too. This guy sure wants a spouse. 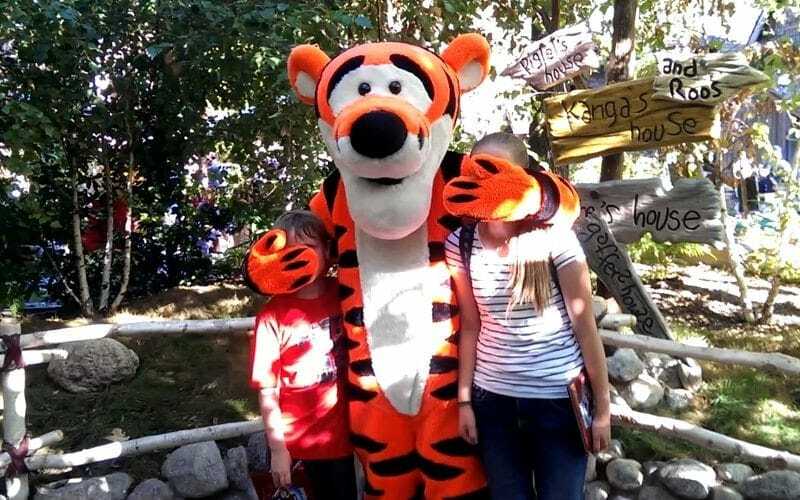 We can’t help but wonder what Tigger was trying to shield these kids from. He is clearly trying to protect them from seeing something they shouldn’t. Either that or they were getting on his nerves and he decided to smother them. We may never really know what exactly is going on in this picture. One thing is for sure, when these children look back on this picture years from now, they’re probably have some sort of interesting memory. Disney parks provide some brilliant settings for photos, although there’s always someone who has to take things to the next level. Don’t worry, the guy here wasn’t really knocked down by this cartoon safe, but we have to commend him for finding such an excellent opportunity for a snap. Why not make the most of your visit to the park by getting into the spirit of things? The bigger the effort you put into your photos, the more jealous your friends are going to be when you post them online. Like we said, proposals are everywhere at Disney parks. There’s so much magic in these places that people can’t think of anywhere more romantic to pop the question. However, despite the fact that proposals happen all the time here, people are still surprised when they see one for themselves. 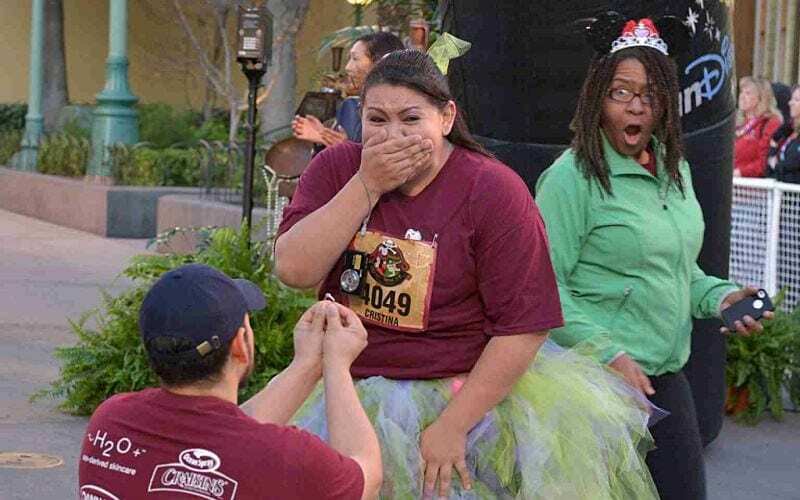 This bride-to-be was probably blown away when her partner got down on one knee, but not as much as the woman behind her. Even though she has no idea who this couple is, she’s lost for words over their engagement. It’s the child who’s supposed to be the most excited about going to Disneyland right? Well, apparently the roles are reversed in this family. The couple looks over the moon to be at the place where dreams come true, but the same can’t be said for their child. Rather than immersing themselves in the magic of the park, they’re lying on the ground wishing they were somewhere else. Clearly, this is one family vacation that was done for the parent’s benefit, rather than for the child’s. Dads tend to get roped into all sorts of things for the sake of their children. Sometimes they enjoy it, other times they don’t, and you can always tell the difference. 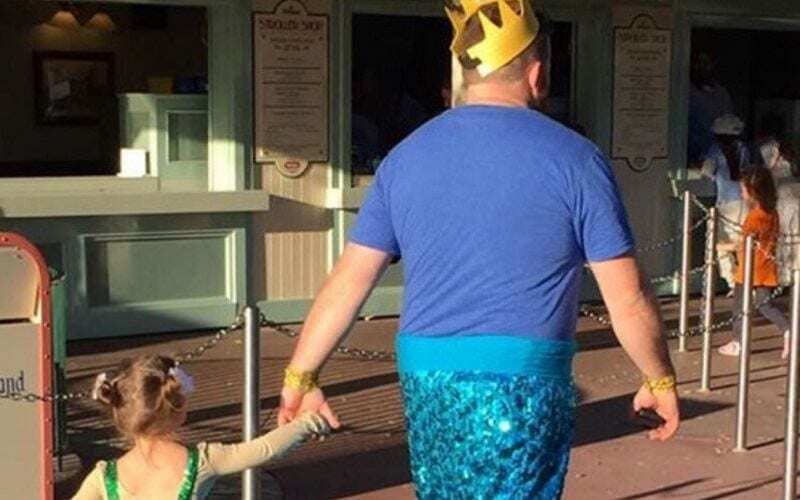 The dads who are willing to dress up for their daughter despite being in public are usually the ones who know how to have a good time. They might look foolish, but all they care about is putting a smile on their kid’s face. Besides, it’s not like they look out of place when they’re at a Disney park. If you’re familiar with Toy Story, you’ll know that the toys are only ever animated when there aren’t any humans around. After all, there’d be a legion of kids losing their heads if their cuddly playmates suddenly started talking back to them. 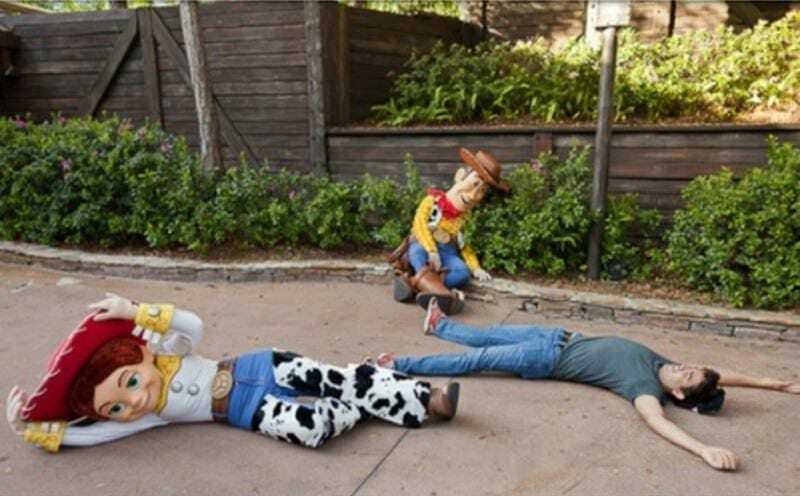 There was a rumor going around that if you were to shout “Andy’s coming” to the toys at a Disney park, they’d all stop what they were doing and pretend to be inanimate. Luckily for them, it’s not true. Otherwise, kids would be shouting it all the time. When you propose, you want everything to go right. You plan each thing down to the last detail so that it all goes off without a hitch, but it turns out there are some things you simply can’t prepare for. This guy wanted to pop the question at a Disney park, hopeful that the excitement of being somewhere so magical would convince his girlfriend to say yes. Unfortunately, as someone prepared to catch the special moment on camera, another tourist got in the way. At least she still said yes. 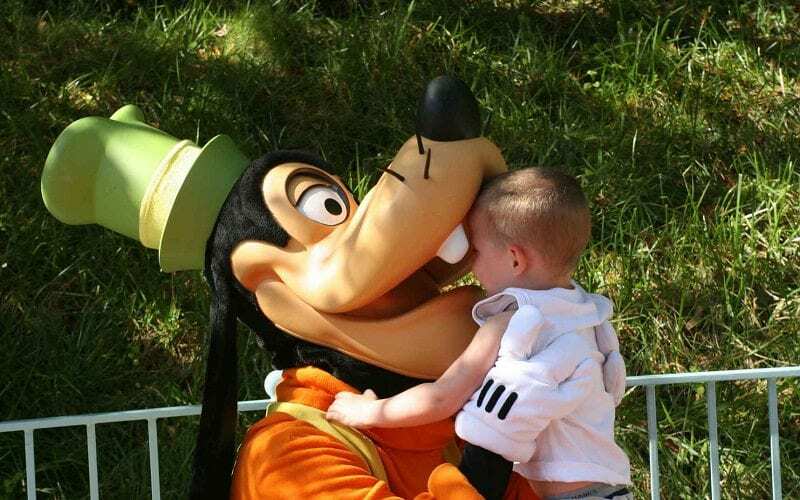 If you’ve ever wondered what Goofy likes to eat, you might be disturbed by the answer. From the looks of it, children are on the menu, and he’s not shy in indulging in his habit. He’ll do it out in the open without a care for getting caught. 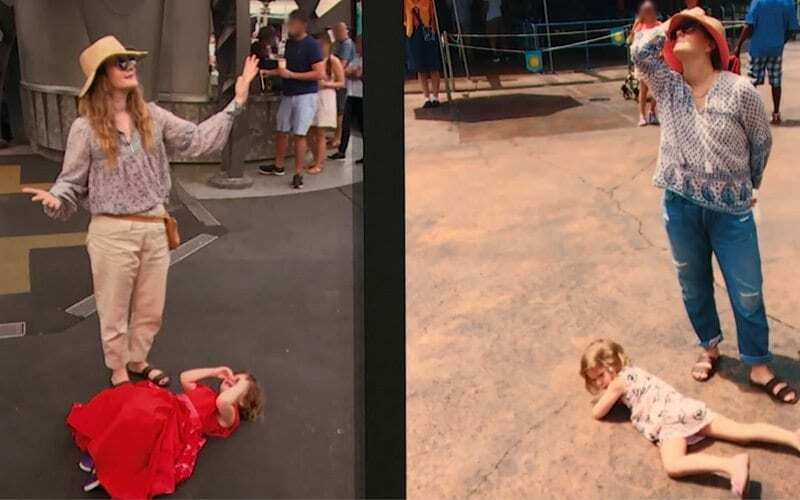 A visit to a Disney park could prove to be more traumatic than you might have thought, especially if you’re a parent. Don’t let the lovable character near your children if you spot him walking around – it could be your biggest mistake. The Splash Mountain ride at the various Disney parks provides the perfect opportunity for a captivating photo. Loads of tourists like to mark their time on the ride by doing something incredibly random when it comes to having their picture taken, but these guys take the cake. Obviously, a lot of planning went into this one, with the group bringing along props to make the photo op truly memorable. Considering that Splash Mountain is a water ride, the five of them are definitely on point with their morning routine theme. Take a look at this picture – can you tell who doesn’t want to be there? 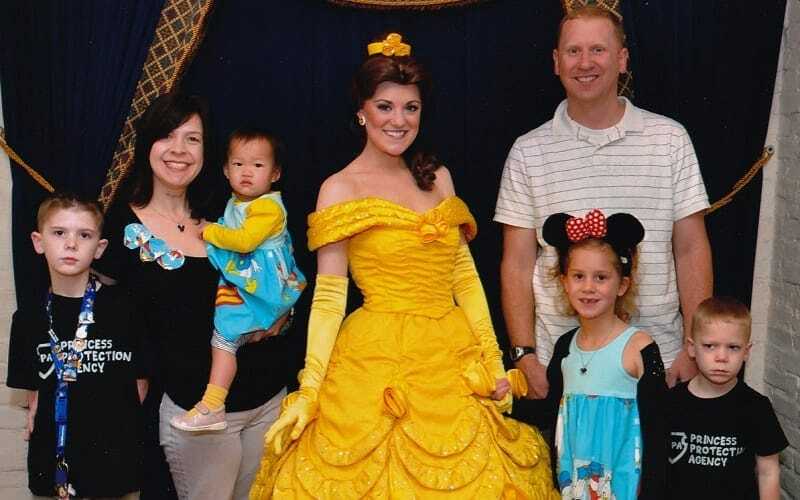 While most of the family seems excited to be having their photo taken with Belle, the boys at both ends appear less than thrilled to be involved. It looks like the Princess Protection Agency didn’t do a great job with its new recruits. They could have hired someone with a bit more enthusiasm for the job. Then again, maybe they’re just taking their work very seriously. Security details don’t usually tend to smile, after all. Mickey and Minnie Mouse are one of those iconic couples that we imagine will be together forever. However, it seems that while everything looks perfect on the surface, their relationship is somewhat strained behind closed doors. Their problems are apparently so severe that Minnie has sought comfort in the arms of another man, much to Mickey’s devastation. Apparently Goofy hasn’t heard of the bro code, otherwise he wouldn’t be sneaking around with his buddy’s girlfriend. This is certainly one love triangle that we never saw coming. 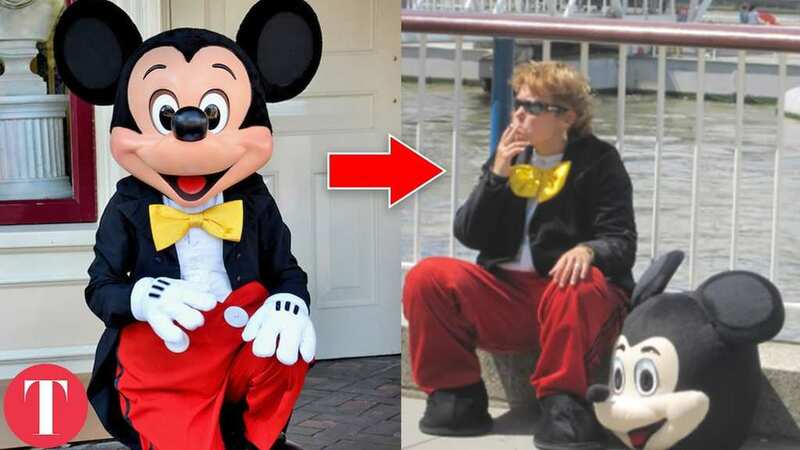 Whenever you see someone walking around in a Mickey costume, you might not think about the fact that there’s a real person underneath the mask. Even if you remember it’s just someone in a costume, it’s still a shock to see them take off their head and reveal the actor underneath. The character goes from being happy and animated to a shell of themselves, and it really puts a damper on a visitor’s experience. There’s a reason the actors aren’t allowed out of costume when they’re in the park. We already know that Disney is not just for kids, but it can make adults feel just like kids anyway. Many grown-ups want their pictures taken with the Disney characters too, and their photos often come out great. 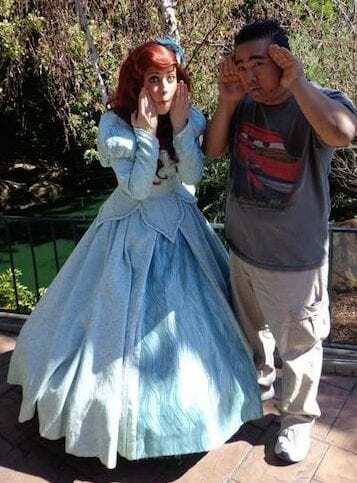 This guy was happy to pose with a princess, but insisted on making a strange fishy face when the picture was taken. The princess, being the fun-loving gal that she is, went ahead and posed in much the same way. The result was this priceless photo. Get her away from me! We get it – the Queen of Hearts is a pretty scary looking character. This terrified child’s reaction makes a lot of sense. He probably doesn’t understand that she is just a regular person dressed up in a very weird costume, so he is justifiably a bit hesitant to approach her. The truth is, we wouldn’t want to get too close to her either, and we know she’s not real. This family should probably try to find some friendlier looking characters for their photos. One of the best things that people get to do when they visit a Disney park is to meet their favorite characters in person (or in this case, in animal). People like to give the characters a high-five, take photos with them, and even give them a big hug. 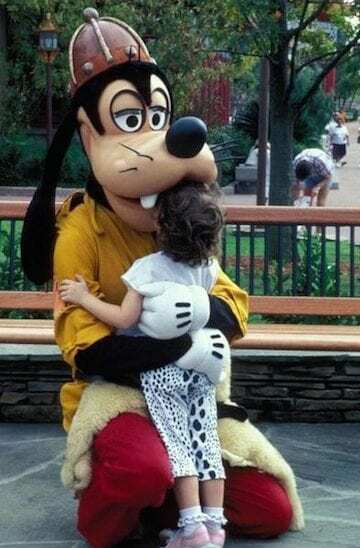 This little girl attempted to do just that, and went up to Goofy for an embrace. His very large snout got in the way, however, and it looks more like he’s eating her for lunch than giving her a hug. 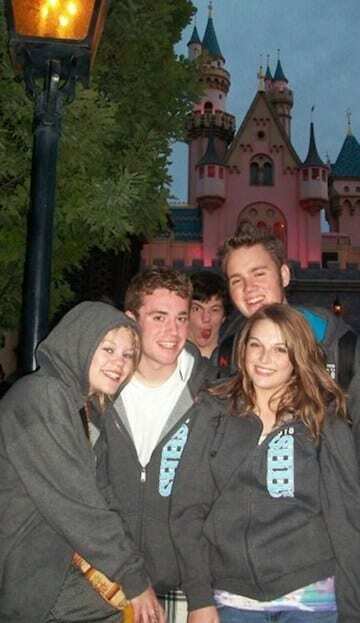 A good photobomb can make any picture hilarious, especially at a Disney park. These four friends were trying to take a nice photograph to commemorate their trip to Disney, so they posed, smiling, next to a street light in front of the castle. The guy behind them, however, spotted an opportunity and didn’t want to let it go to waste, so he distorted his face, looked toward the camera, and turned the sweet picture into something else entirely. Every year, there are races at Walt Disney World, part of a weekend event where people dress up as their favorite characters to run their choice of distance. 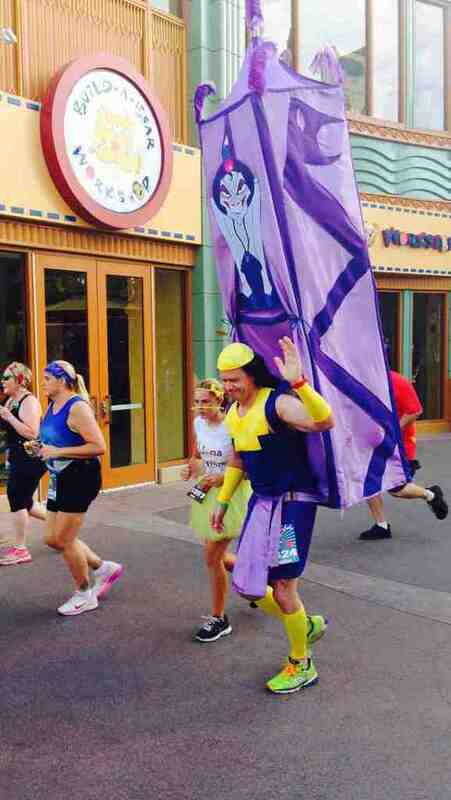 This man ran his race dressed up as Kronk from The Emperor’s New Groove, and even built a covered litter for his back to carry the evil royal adviser, Yzma. It’s quite fitting, since in the film, Kronk runs a long distance with Yzma on his back. This ingenious costume doesn’t look too easy to run in, but certainly makes for a funny sight. When you’re taking pictures, it’s usually pretty important to include the faces of the people you are photographing. In this case, however, that proved impossible, and not because of the photographer’s lack of skill. This happy family wanted a photo with Belle and the Beast, and the characters obliged. 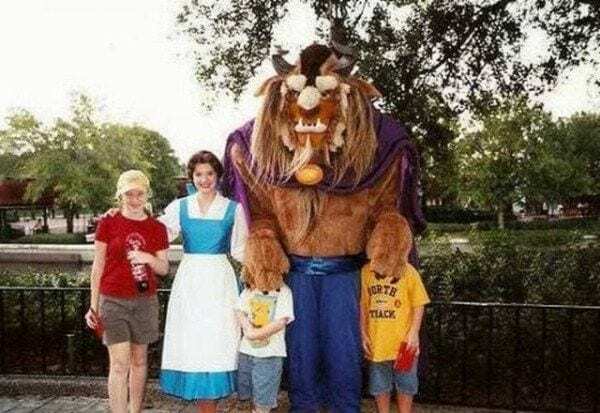 However, the Beast covered the heads of the two small children with his giant paws, and the picture turned from a regular Disney character photo into a hilarious picture worthy of this list. What is that duck doing to my sister? 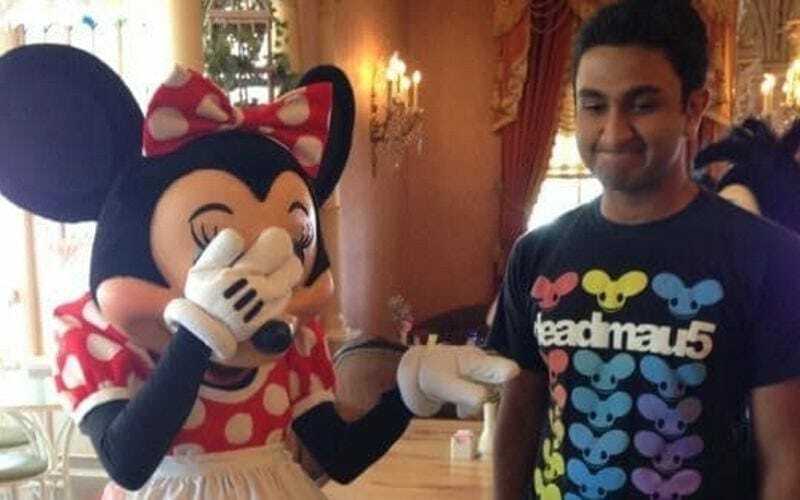 Disney World can be a lot of fun for kids, but it can also be terrifying. Sometimes, when children are very young, they don’t quite understand what’s going on with all of these life-sized animals and characters. 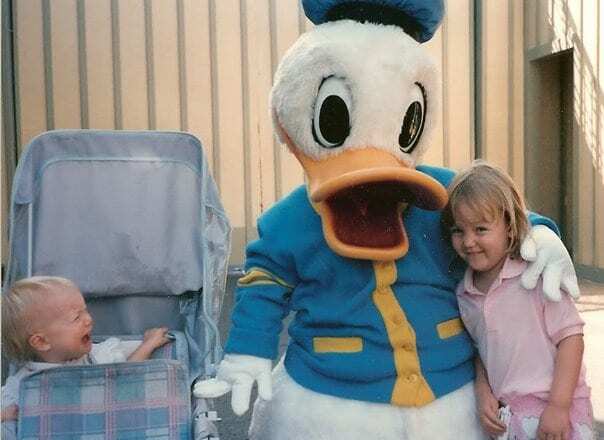 When Donald Duck posed with his arm around this smiling little girl, her younger brother seemed to think that she was under attack by a giant duck. His reaction is pretty understandable, because if this happened anywhere other than Disney it would certainly be alarming. 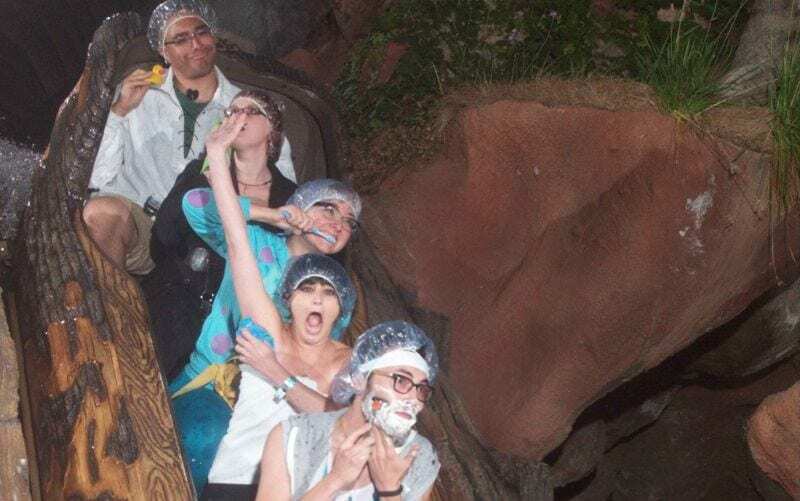 Splash Mountain is one of the best known rides at Disney World, and many people are serious about the famous photo op during the big drop on the ride. They come ready with props and ideas to make the picture they will receive after the ride unique, memorable, and worthy of putting on their refrigerator. 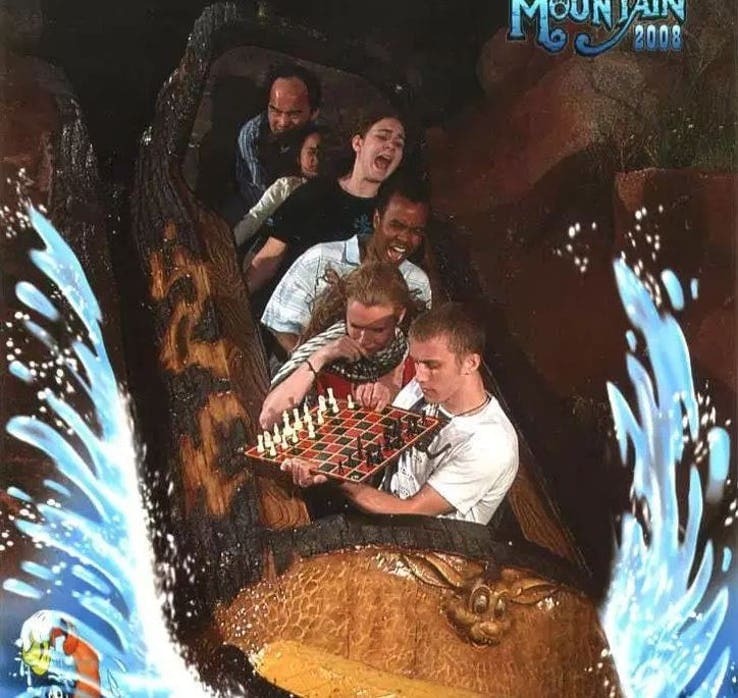 These two friends decided to bring along a chess board (with the pieces glued down, of course) in order to pose as if they are playing a game of chess during the ride. 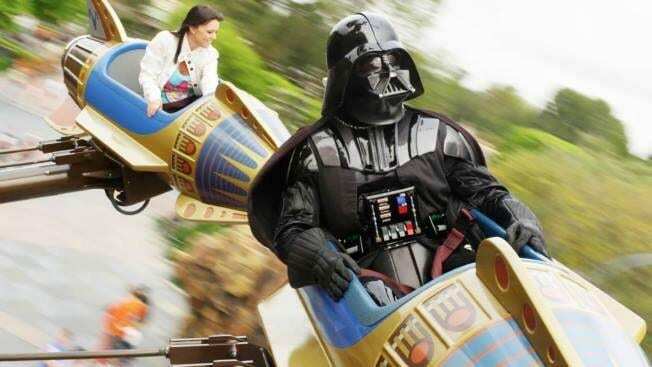 Just because Darth Vader is an evil Jedi master does not mean that he doesn’t want to take a turn on the rides at Disney World. Here, he is pictured riding the flying spaceships on the Astro Orbiter ride in Magic Kingdom. We wonder how it compares to the spacecraft that he is used to – we can’t imagine that such a character would be too impressed by the spinning ride, but he sure looks like he’s having fun. 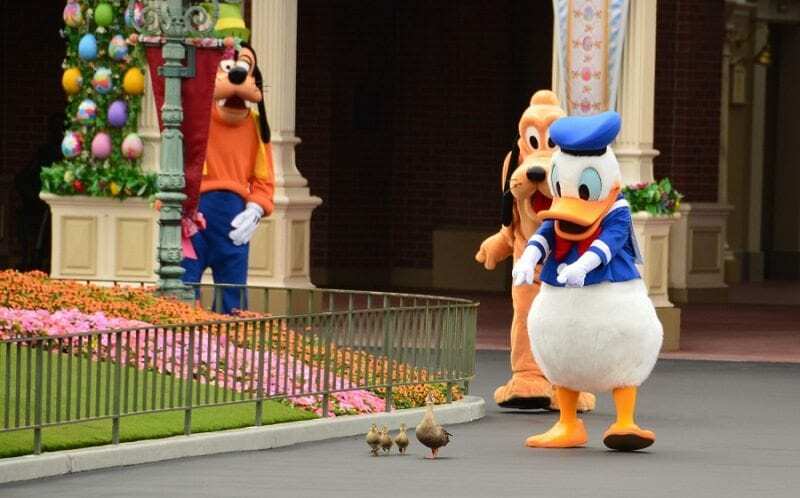 Children are sometimes put off by the big furry Disney characters. While adults know that they are benevolent and safe, little kids aren’t always so sure about them. 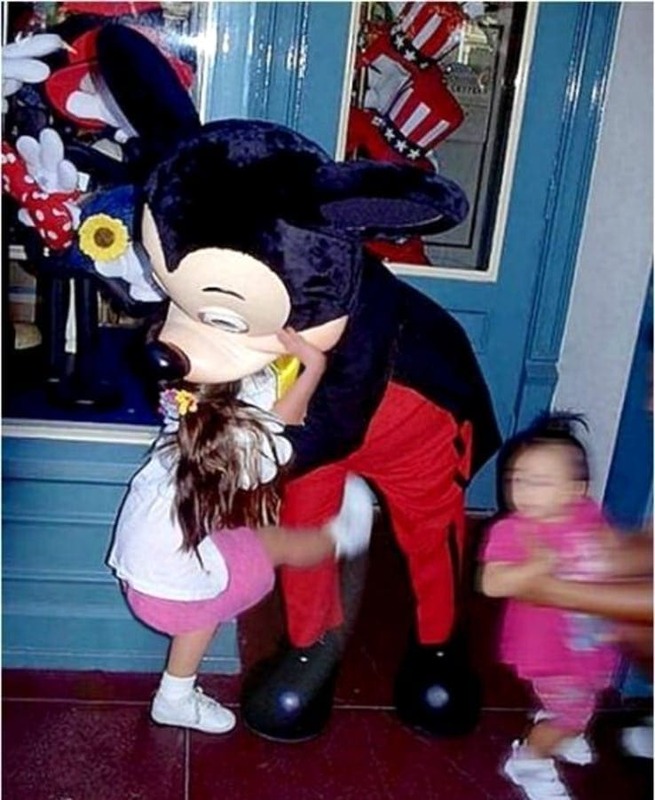 This little girl probably didn’t want Mickey Mouse to touch her, so when he came in for a hug, she did the only thing that made sense at the time – try to push him off. The reaction is understandable, because who would want to be grabbed by a strange giant mouse anyway, but it’s definitely not what her parents expected. If you were to encounter a wild tiger during breakfast, it would be perfectly logical to throw your body to the floor and hide under the table. 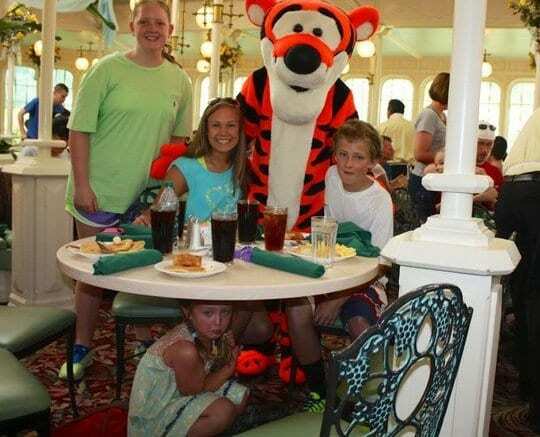 This little girl did just that when Tigger approached her family’s table. The rest of them posed, smiling happily next to the giant fictional cat, but she didn’t want any part of it. The photographer still managed to get her in the photo, but it’s probably not going to be framed and hung on the wall. Disneyland is often called “the happiest place on Earth,” but this picture seems to indicate otherwise. 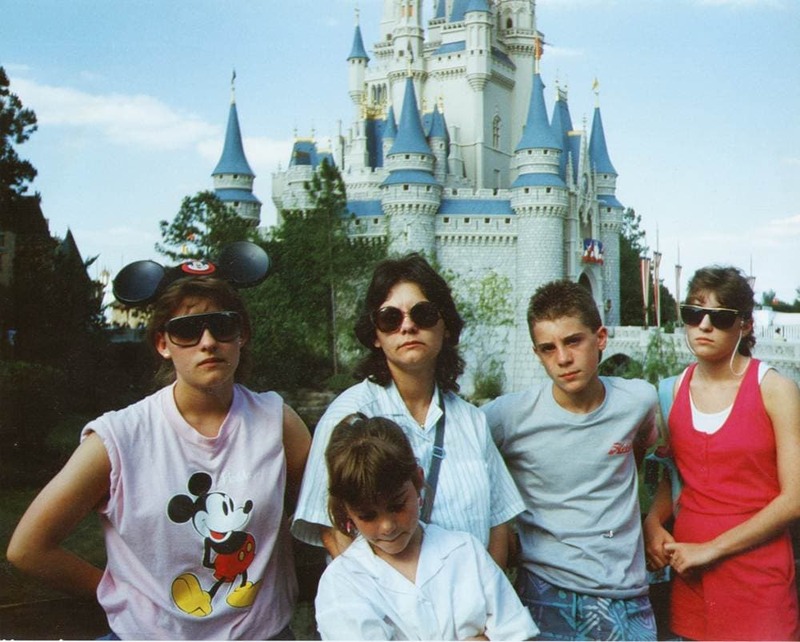 This family posed in front the Sleeping Beauty Castle but instead of smiling as is traditional in photos these days, they all stared straight into the camera with surprisingly serious looks on their faces. We wonder what happened that made them so stoic, because Disneyland is full of rides and fun, but maybe theme parks just aren’t their thing. The picture is strange because it’s simply not what you expect. Unforgettable U.S. Olympic female figure skaters – where are they now?